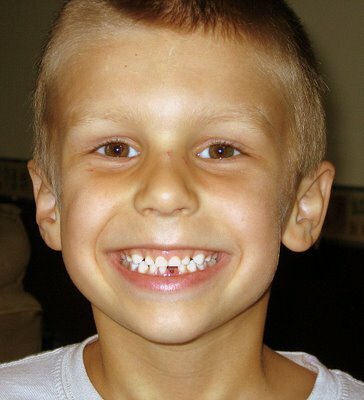 Kirsty Wertz (nee Reid): Kyle loses his first tooth. Kyle loses his first tooth. Kyle says, "On Wednesday, I had a loose tooth and we tried the door-slamming thing and then the second time, Daddy couldn't do it, so we tried pulling it out and that really worked. Here's a photo of me with my tooth out. The tooth fairy left me five coins under my pillow - fifty cents. I put it in my frog-bank which is where I put all my money to save up and go see Uncle Malcolm."